Habit: Shrub-like, stem often short, forming basal rosettes, scapose, often rhizomed, generally dying after flowering. Leaf: long-lived, sessile, lance-linear to ovate, thick, generally rigid, often fleshy, glabrous, armed with marginal teeth, spine at tip. Inflorescence: panicle-, raceme-, or spike-like, bracted, often with bulblets. Flower:  paired, or in clusters of 3--40; perianth generally funnel- or bell-shaped, yellow to green-yellow, parts petal-like, 6 in 2 whorls, fused basally, lobes erect to ascending or +- spreading distally; stamens 6; ovary inferior, 3-chambered. Fruit: oblong to ovoid, often beaked, loculicidal. Seed: many, +- flat, black. Unabridged Note: Cult material may be identified using Gentry 1982 Agaves of Continental N. America. Univ. Arizona Press. Habit: Stem 0.5--2 m; rosette 1, 0.8--20 dm. 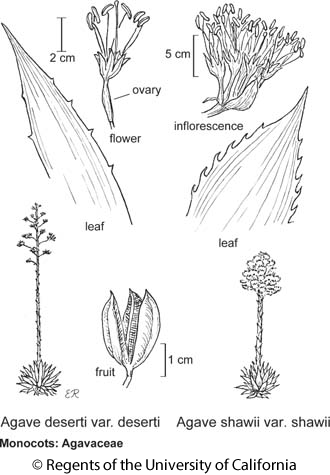 Leaf: 20--50 cm, narrow-ovate, marginal teeth 5--6 mm, 1--2(5) cm apart, tip-spine 2--4 cm. Inflorescence: panicle-like, 2--4 m including peduncle; bracts 10--25 cm, lanceolate to triangular, persistent; branches generally 8--14, generally 10--20 cm; flowers 35--75 per cluster. Flower: yellow to +- red; perianth 6--10 cm, tube 12--19 mm, wide-funnel-shaped, lobes 17--40 mm, unequal; stamens long-exserted, filaments 4.3--7 cm, from middle of tube, yellow, anthers 20--35 mm; ovary 3--5 cm. Fruit: 5.5--7 cm. Seed: 4--7 mm. Citation for this treatment: James L. Reveal 2012, Agave shawii var. shawii, in Jepson Flora Project (eds.) Jepson eFlora, http://ucjeps.berkeley.edu/eflora/eflora_display.php?tid=82138, accessed on April 19, 2019.
s SCo (sw San Diego Co.); Markers link to CCH specimen records. Yellow markers indicate records that may provide evidence for eFlora range revision or may have georeferencing or identification issues. Purple markers indicate specimens collected from a garden, greenhouse, or other non-wild location.